Love your subtle print mixing! A perfect spring look! I love when you do your nautical looks. This skirt is amazing. Love this outfit, it is so gorgeous. I LOVE that pink rope bracelet! SO SO pretty! Which store is that from? Me encanta el look lady, estas guapísima! Awesome look! That anchor top was my favorite shirt to wear last spring and I love the idea of pairing it with the sailor stripes! I love your top!!! love the lipstick too! this is such a lovely assemble! it does call for some spring weather.. Such a preppy fun look – totally in love with that striped skirt! Love this nautical look! Especially the top and skirt combo! Such a perfectly preppy look! Love how you styled this shirt. Still snowing in OHio too! But I love this look! love that wrap skirt and of course the colors! I have that top and always feel like I should be hanging out at some harbour! Sunshine or not, you look fabulous hun!! I love every single thing about this outfit. From the anchor tee to the super cute striped skirt to your shoes. You look gorgeous! You look adorable! I love the stripes and the anchors! That’s a great spring look! I like how the pink stripe in the skirt softens it up too. This is so pretty. I love this skirt. One of my favorite outfits of yours. I’m loving that skirt! So cute. Nautical looks are my favorite! This is such a pretty look for spring! Love this top paired with your skirt. Absolutely gorgeous Rach. I love pairing blue and pink together and you did it so well! lovely outfit! really love the skirt! Such a pretty outfit! Because of your blog I have started to buy more skirts (as opposed to dresses). You keep showing how versatile they are and have proved their importance in my wardrobe. Thanks for the inspiration!! I have that anchor J.Crew top, and I love it!! It can be worn so many different ways, and it looks perfect with your skirt! Just perfection! I love new ways to style classic favorites like this J. Crew anchor blouse. The pink and navy are such beautiful complements. Love!! 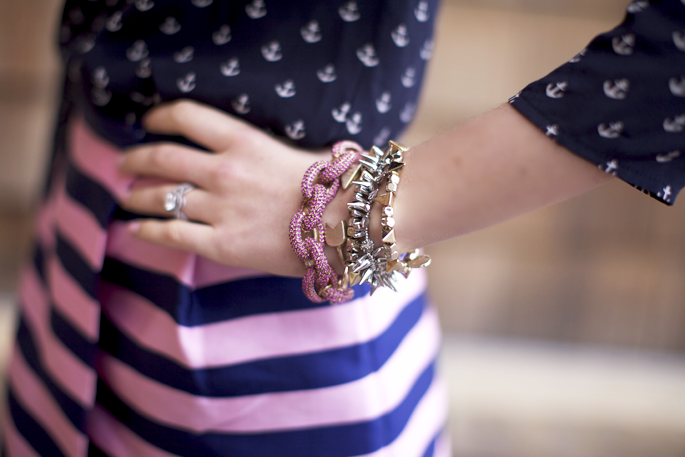 Love this nautical pink/ blue version… you look fun and chic! Love your jewelry in this post! That pink pave link bracelet is beautiful! The muted pink is a great match for navy as opposed to the usual bright pink-good choice! This is such a pretty look for Spring! I love the mixed prints! Love the stripes and nautical shirt! That skirt is so pretty!! Love the nautical look! I have that same top!! I am so in love with this outfit!! Such a great spring look! Love this outfit. It’s perfect for Spring and for Easter next weekend. Love the arm candy.I’m doing a link up next thursday. HOpe to see you there. Such a cute nautical look Rachel! Hang in there girl, Spring is around the corner. I promise. The navy and pink is perfectly coordinated! I’m envious of the skirt weather near you. i love this look! the anchor top is so adorable and your pink lips are perfect! tres chic! Cute! Love anything nautical. Recently did a nautical outfit post myself! What a gorgeous skirt! Glad you were able to wear it before the temp dropped again. Our is all over the place too! Love the mixing of patterns, and that skirt is to die for! Stunning outfit! Gorgeous like always. I love your skirt, it’s so pretty. I love pink and navy together. So pretty! I remember a few years ago black and red was the trendy color combo. I like pink and navy so much better…not so vampirey. This is the second nautical-inspired look I’ve seen today. And it makes me happy – happy that spring is around the corner (spring weather since spring is technically here)! love this cute outfit! maybe my favorite look of yours :) love the navy and pink together! I love this! The colors and pattern mixing is perfection! You look beautiful! Great outfit! I really love that old J. Crew top. I love this entire outfit…so ladylike and classic! Same here, gorgeous weather and now blah! Very pretty. I like the pink and navy color combo. So jealous of your beautiful weather! It’s still very cold here — only high 20s! I love the nautical mix of navy and pink, and I love how you mixed the prints with the bold stripes. I love nautical details!! You look so pretty! A great twist on the classic navy and red nautical, I love it! I love this outfit it just suits you perfectly! I mean it great choice. Beautiful look. Love the pink and navy accented with a pink lip! Beautiful. Love the nautical look! Gorgeous look! I just love that skirt. I love anything nautical! Pink and navy are perfect together! Ummm…. I’m kind of obsessed with that skirt! How fun is that! I’m glad the wrap skirt is coming back… I was all about that. The pink and navy is precious together! Those shoes! Sole Society is great. I LOVE your hair!!! How do you style it? I’ve always wanted to style it like this, but my curling iron makes it too curly. Is the key a larger barrel? Absolutely lovely outfit. Love the stripe skirt with the anchor top. really pretty. Such a cute spring outfit. I love pink and navy together. That skirt paired with those little anchors — loving the combination so much! That skirt and top are amazing! I love them both so much! The pink and navy look great together! I saw some sun today, but it was also about 30 degrees so it doesn’t really count. Ahh I wanted this skirt but didn’t grab it. Looks fantastic! Very adorable look! I am so in love with your style! I love that anchor print top! This is so classic and feminine. I love nautical with a pink spin! I really like this look on you. So glad I stumbled across your blog! Are you kidding me? This is just too cute for words. I’m really loving the anchor print and stripe combo! So cute :) Love the skirt and shoes. I love this top, I have it as well :) I love to wear it with a hot pink j.crew pencil skirt! I love this top, I have it as well :) I love to wear it with a hot pink jcrew pencil skirt. Gorgeous girl! This sophisticated take on nautical is really pretty. Love your pretty pink lipstick too. Can you tell me what c/o means in the description of what your wearing?? I discover your blog by the giveaway on “coast with me” blog, and I like your blog !!!! Love your outfit and style :-) I’ll be happy if you come and see my blog you too, and if it likes you, maybe we can follow each other :-) Have a great day ! I love LOVE this look! Perfect for spring… Those heels are so cute! This is lovely, the pink and navy go so well together! OBSESSED about your necklace! So cute!